5 responses to "Labour chooses a Miliband"
Meh. His name doesn’t even lend itself to a decent anagram. Well, there’s I AM BLINDED for a start. That’s one more than Gordon Brown ever lent himself to. “I, Ed. I’m bland” would suit too. The people’s flag is palest pink. We’ll sing the red flag once a year. Except they don’t anymore, do they? Unhypocritical bastards. Mark Steel notes the anti-union element of the coverage “as if the unions aren’t made up of millions of people but are a pair of illegal bookies and a drug-dealer who, because of a quirk of history, make up 30 per cent of the electoral college. You might as well say the only reason the Tories won the election was they sneaked in with the votes of Tory voters”. Since when did union membership – something a quarter of British employees engage in – become something threatening and undesirable? Gall of the Day award goes to Baroness Warsi for saying “Ed Miliband wasn’t the choice of his MPs, wasn’t the choice of Labour party members but was put in to power by union votes”. 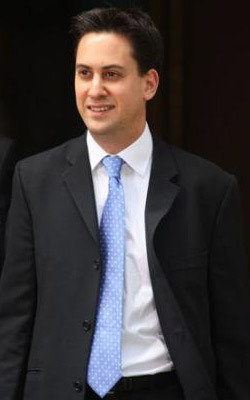 Miliband was elected to leader of the Labour Party by many thousands of voters. As opposed to Warsi, in Cabinet despite having been elected by nobody at all.